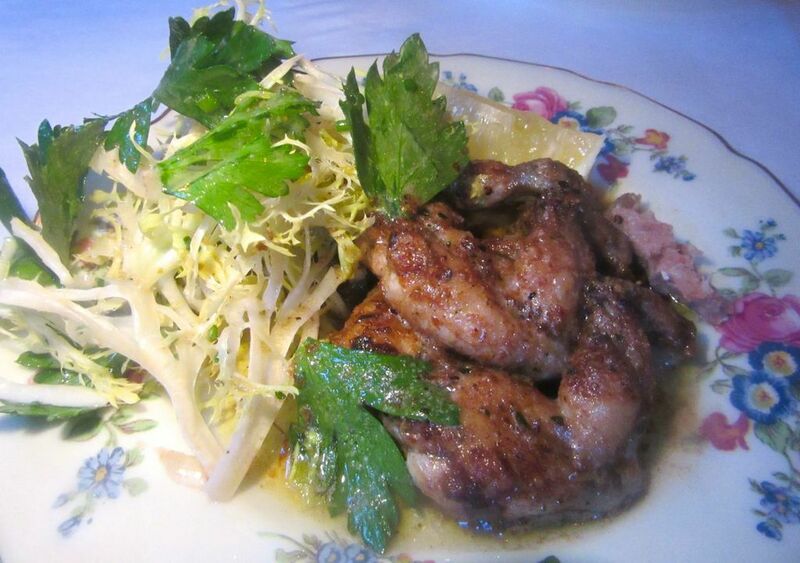 At one dinner our table is covered with super rich choices like this poulet à la crème. Bistro Pierre Lapin has settled on a tranquil stretch of Bank Street. How does the notion make me smile? Let me count the ways. I like the sketch of Peter Rabbit in the menu and his silhouette on the window next to the booth where we’re seated tonight. I love the blue flowered wallpaper – custom-designed, very expensive – perfect for an old-fashioned boudoir. Velvet banquettes on one side, fussy blue fabric booths on the other. I love the fancy china, the unmatched silver, the checked gingham café curtains. 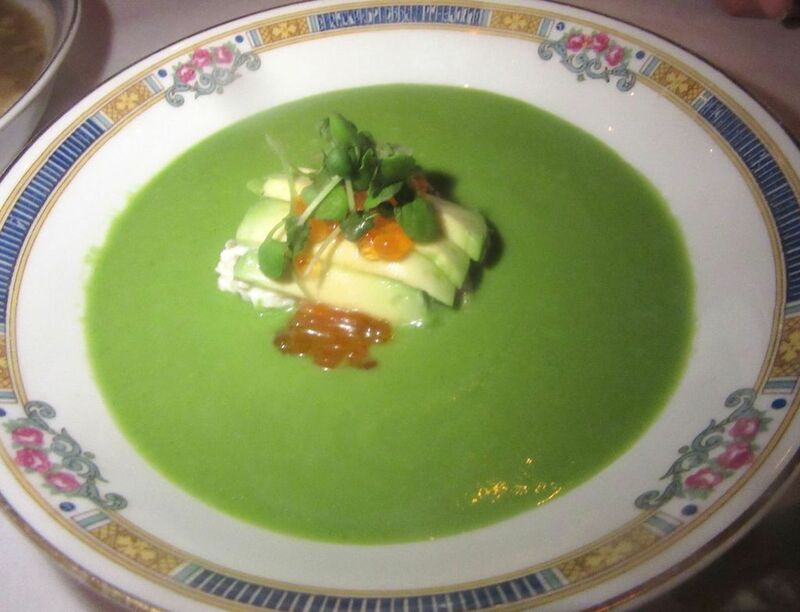 Chilled avocado vichyssoise is garnished with crab salad. 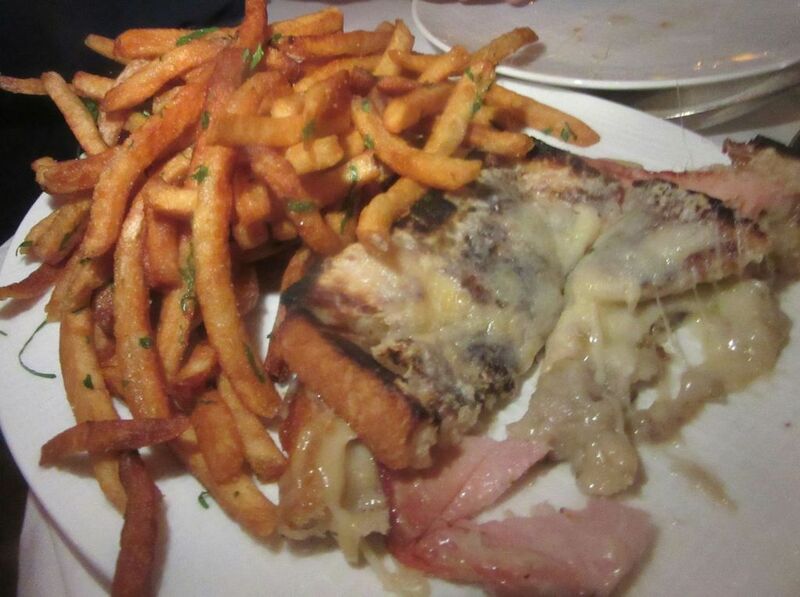 Pommes frites accompany all sandwiches, including this traditional croque Madame. I’m especially taken by the menu choices, so all over the place – sautés, stews, pastas and sandwiches – not like an authentic bistro at all, but rather an American dream of France. After honoring the avocado vichyssoise, the lush triangle of Croque Madame, the snails with fava beans, and oddly, a sunny-side up egg, I don’t dare more than sample a taste of what friends have ordered. 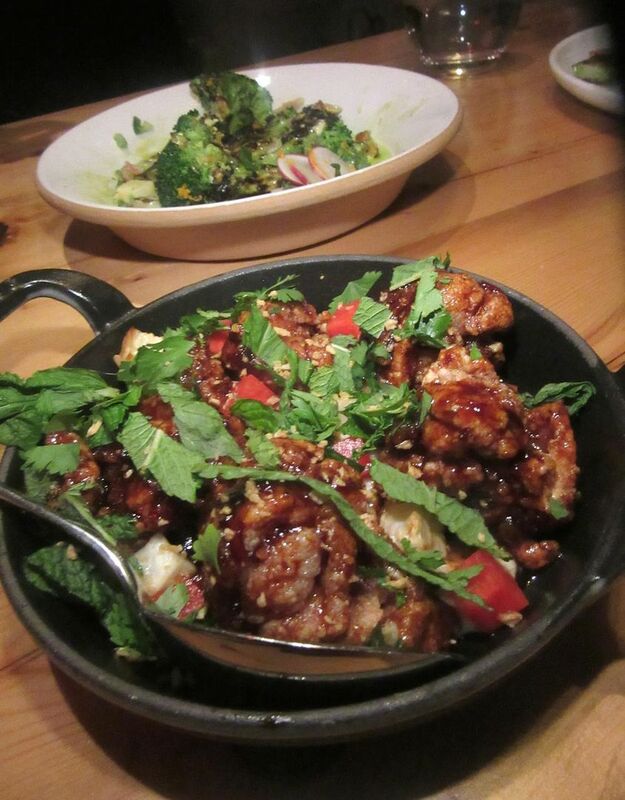 So many options – I can’t wait to come back and taste more. 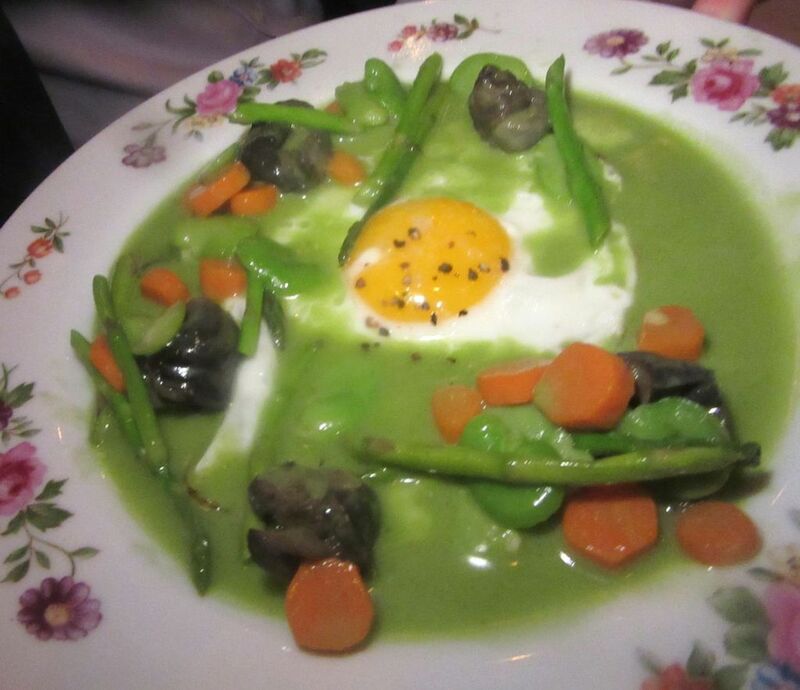 Snails float in a garlicky fava-green sauce with a sunny side up egg on another plate. 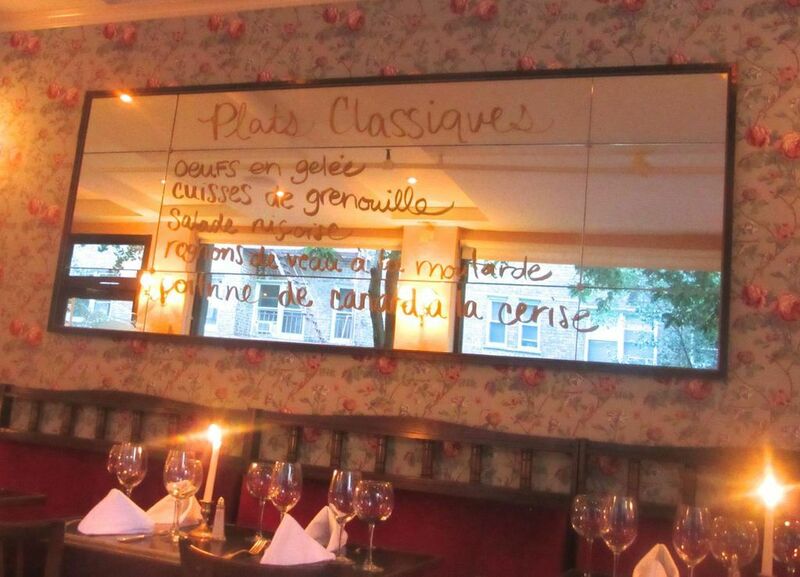 The classic specialties of the evening are written on the mirror opposite our table. Full house a few evenings later: We consult the writing on the mirror for the evening’s classics. Cuisses de grenouilles, rognons de veau à la moutarde, duck breast with cherries. The house-baked baguette arrives warm in its basket, with a small plate of giveaways: a chunk of terrine, truffled cheese, olives, cultured butter. 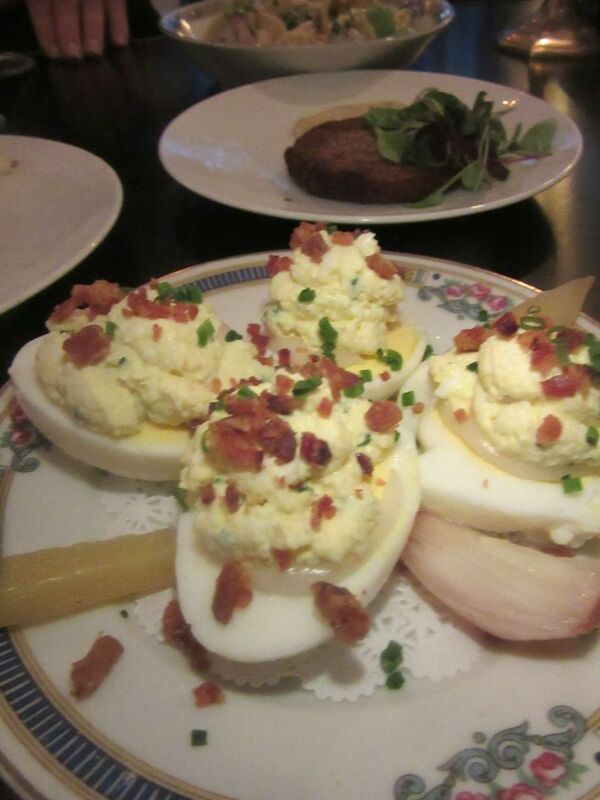 And at the same time, our deviled oeufs mayonnaise with crispy bacon and pickles. 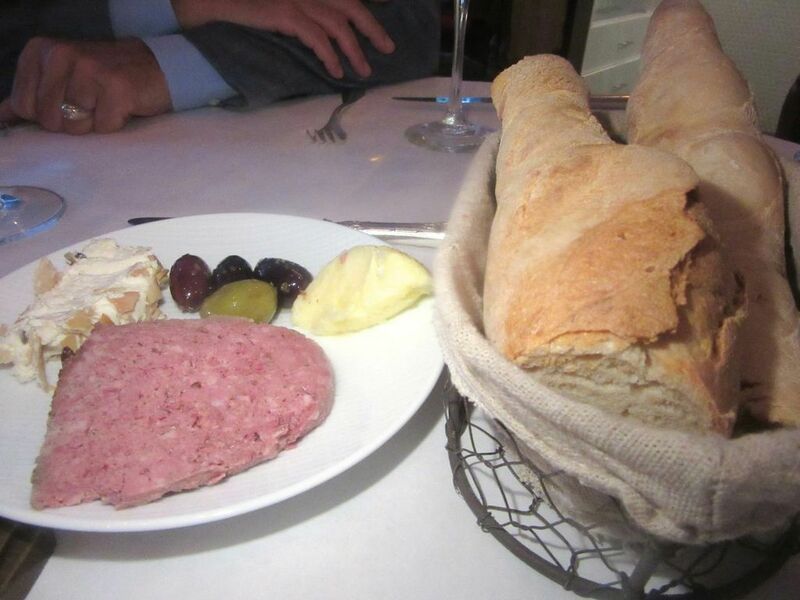 House-baked baguette is served with an amuse-bouche of terrine, goat cheese, olives and cultured butter. Deviled eggs mayonnaise are studded with bacon crisps and served with pickles. Decades ago, when I was in early prep to become the Insatiable Critic, lunch at Henri Soule’s La Cote Basque offered irresistible hors d’oeuvre variés. I’m reminded of those many tidbits tonight by Pierre Lapin’s Le Ravier, the rolling cart of marinated vegetables, trundled tableside. 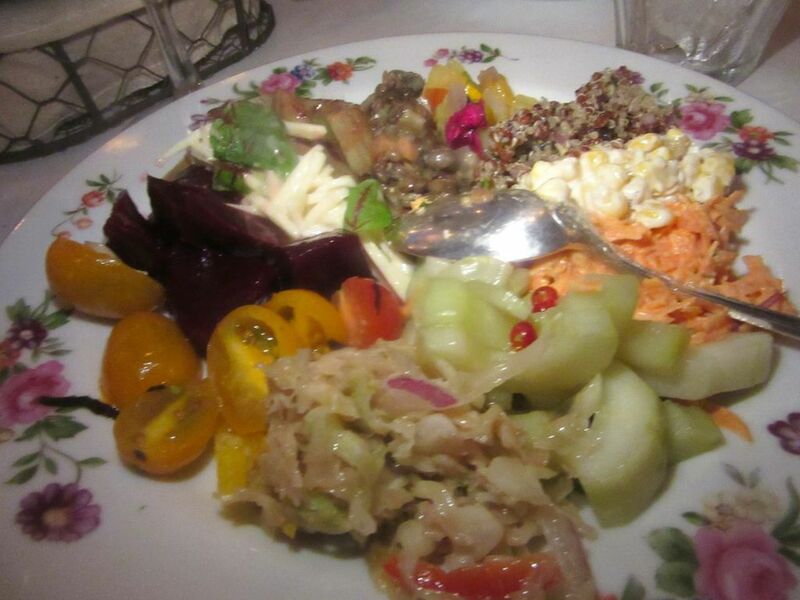 The ravier, a collection of vegetables salads on the rolling cart remind me of hors d’oeuvre variès I loved. The server offers by name and I select from the ravier, a little of everything of course. The server recites. 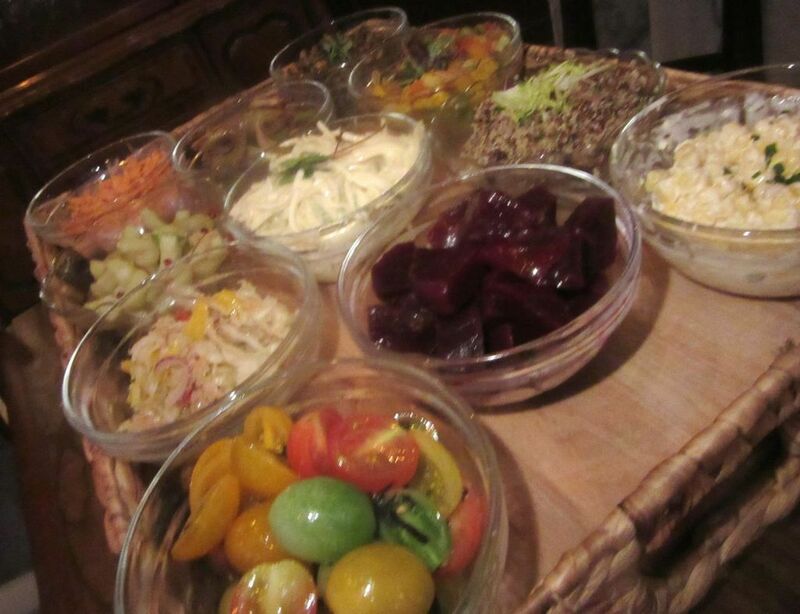 Marinated beets, lentil salad, celery remoulade, leeks vinaigrette, quinoa salad, marinated tomatoes, grated carrot, corn salad. Yes. Yes. Yes. I’ll have them all. Ravi is French for thrilled. Ravier is correct. I offer tastes to my companions, delighted they don’t seem all that interested. After an abundance of starters, I decide that a single lamb chop with scalloped potatoes is a sensible followup. I’ve had a passion for quenelles de brochet since I first discovered them. You don’t find them on many menus. 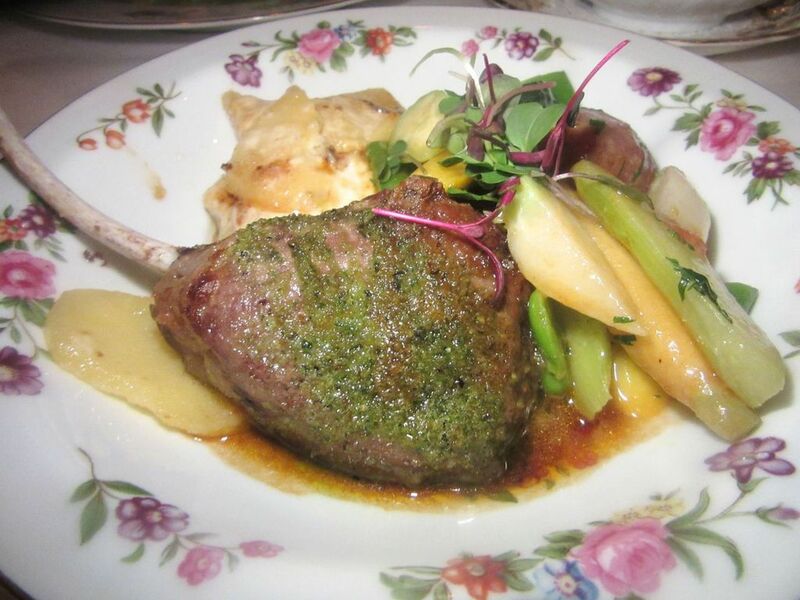 After the generous amuse bouche, the compelling baguette and the ravier, a single lamb chop with potatoes au gratin seems like a sensible entrée. 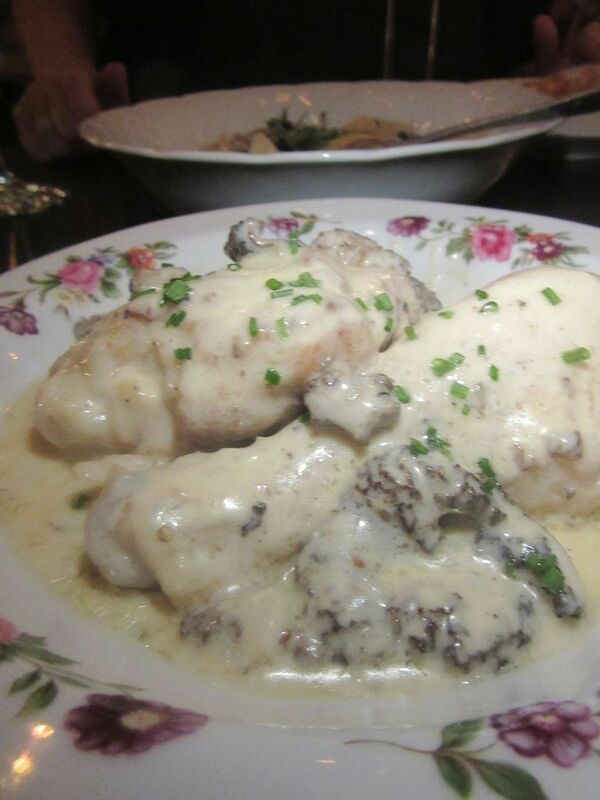 At a second dinner, I’m glad three of us are sharing the chicken leg à la crème and the super rich quenelles. I can’t recall the last time so many choices came floating in cream. My companion orders the special frog’s legs and offers me a limb to munch on. Chef Harold Moore stops by to explain tricks he’s devised to dispense myriad options with just a few hands in the tiny kitchen. Neither of us mentions the longish wait between courses to him or that our waiter has a way of blindly walking by when our table needs his attention. We’re sharing the salad of wonderfully ripe tomatoes and peaches. 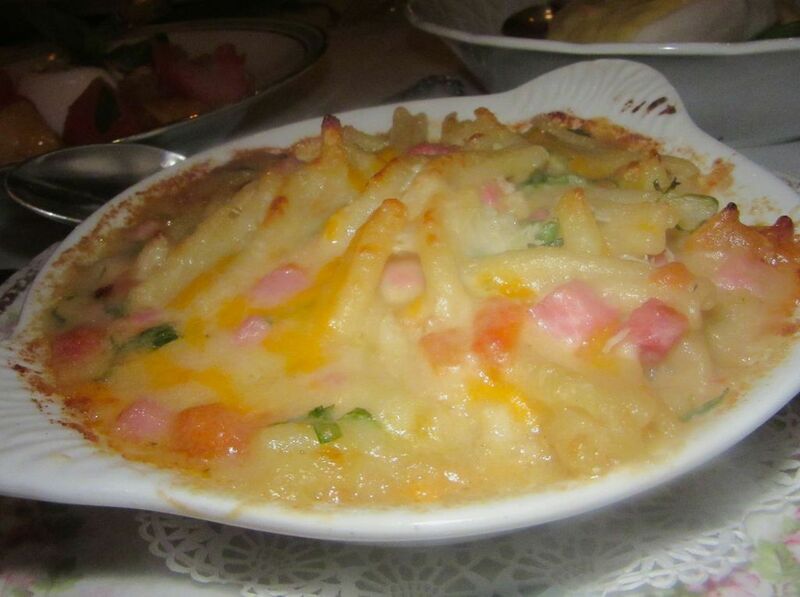 Usually I can’t resist macaroni but Pierre Lapin’s with Comté and cheddar, ham and tomato is resistible. Not everything is worth repeating. The pan-fried pork head terrine with ravigote sauce is clunky, lacking the allure of the mushrooms flambéed in cognac. And the whole lot is not all that French. 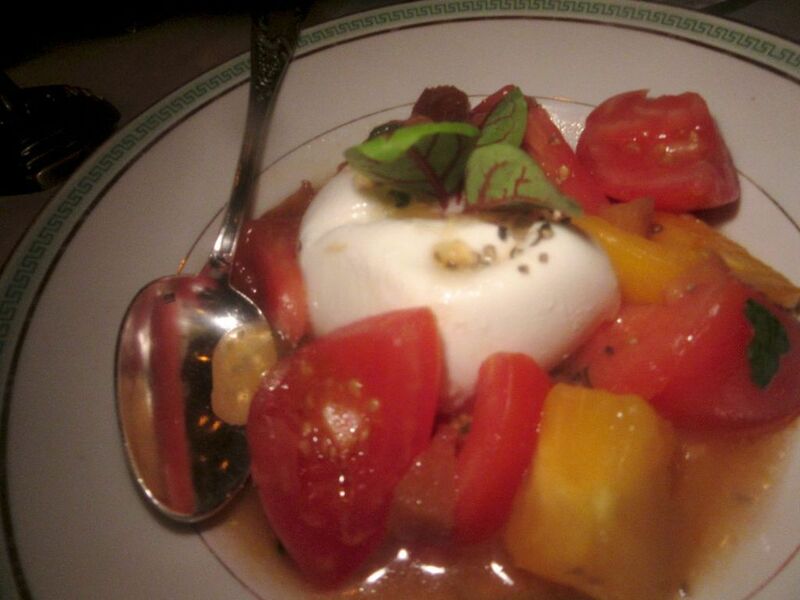 The salade of lusty tomatoes and peaches seems more New York August in July than Paris to me. Tortelloni stuffed with rabbit carbonara and the red wine-braised ravioli of boeuf bourguignon are pasta bombast, definitely worth trying, though neither French nor Italian if you’re examining bistro credential. 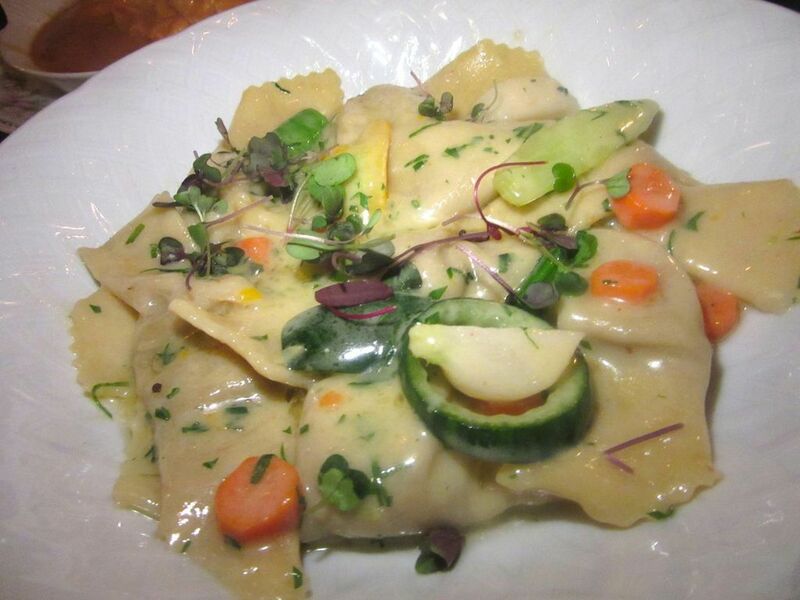 The ravioli is stuffed with red wine-braised short rib and tossed with vegetables and miniature greens. 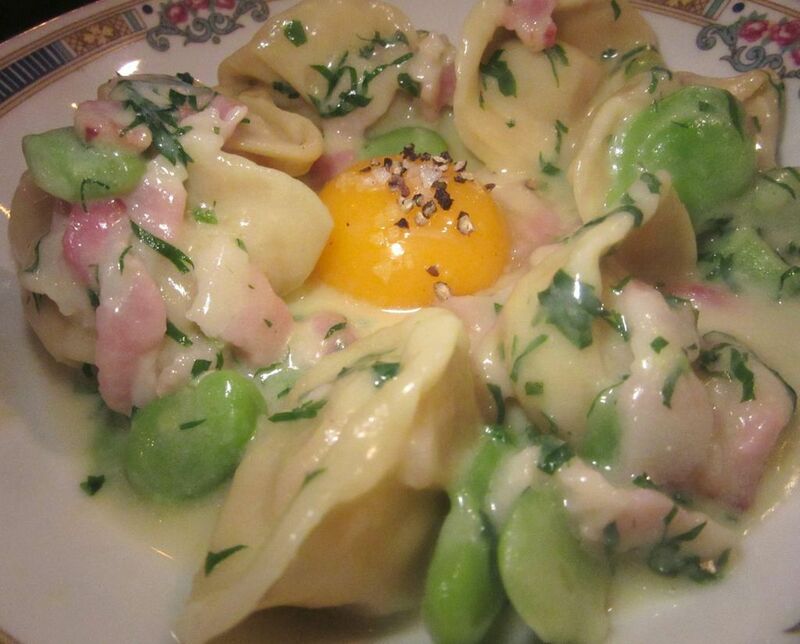 Rabbit-filled tortellini jardiniere is served with egg yolk carbonara and bacon. 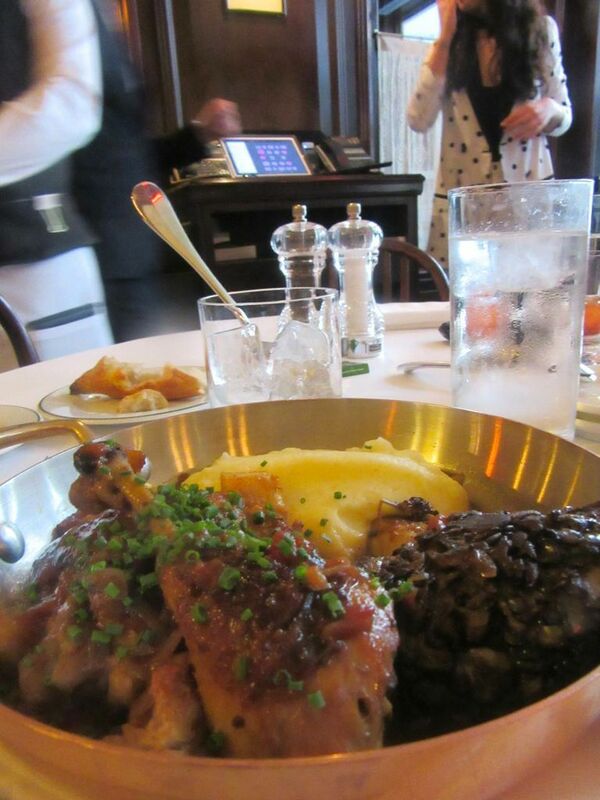 Specialties like quenelle de brochet in Nantua sauce, a chicken leg poached in sauce au vin jaune with cream and morels, and the blanquette de veau are reasonably priced compared to the less interesting “plat principaux” -- halibut or salmon, bone-in pork chop “shake and bake,” and filet de boeuf at $36 to $44. A large side dish of endive wrapped in bacon could take the place of a main course, following the ravier, even if divided for two. 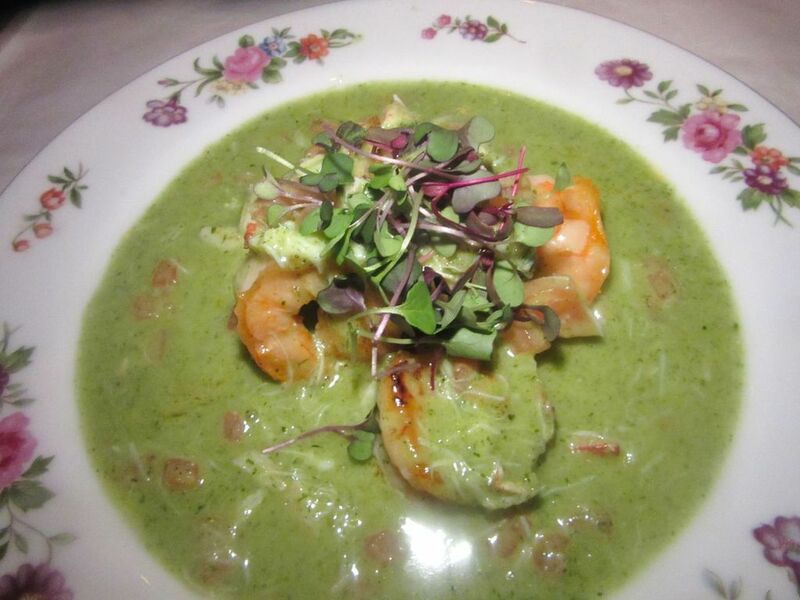 Shrimp and crab float in a green scampi sauce with a nest of leafy raw greens on top. The whole chicken with foie gras stuffing and potato purée or a 36 oz dry-aged prime ribeye with two sides are suggested for two or three. A roasted leg of lamb for 4 to 6, requires 24 notice. Next winter maybe we’ll sign up for that. 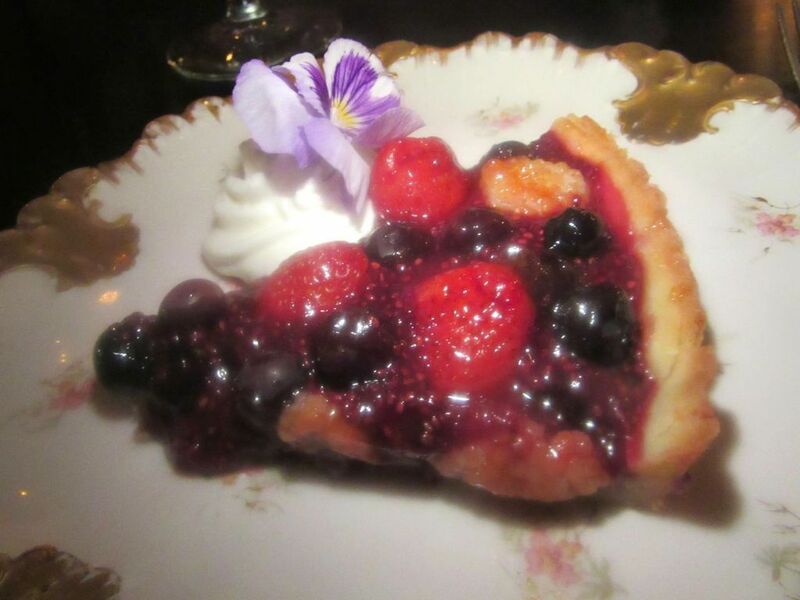 This delightful triangle of fresh berry tart looks like it was tossed together to order. Partner Julia Grossman is in charge of the drinks and the dessert menu. One evening we share the carrot cake Madeleine. On another I’m the only one game for the primitive berry tart, house made (as if you’d ever doubt it). Tonight Grossman suggests apricots marinated in Grand Cru Sauternes. Don’t faint when you discover apricots in Grand Cru Sauternes cost $17. You deserve them. My companion is leaning toward the berry tart. “How often does anyone offer apricots?” I ask. 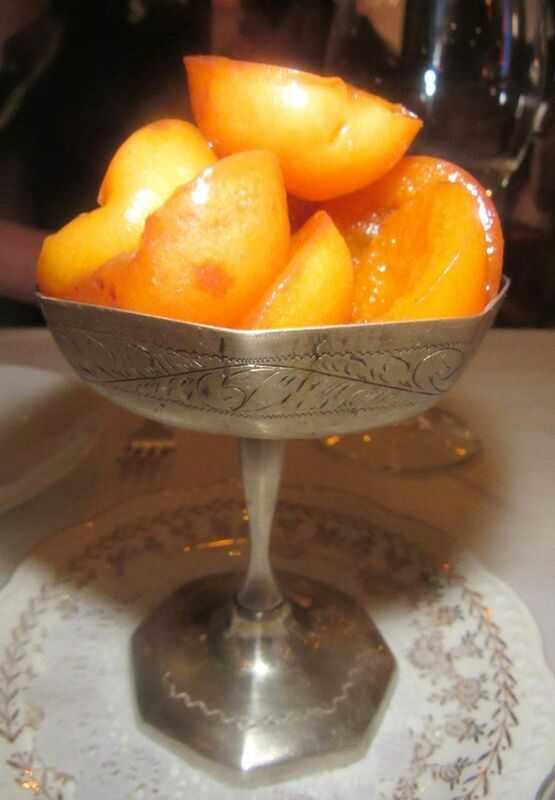 “And apricots have such a short season.” A dozen halves of raw fruit in a boozy peignoir stand up in the compote. The wine is overpowering. I’d like them riper perhaps, or even lightly poached. 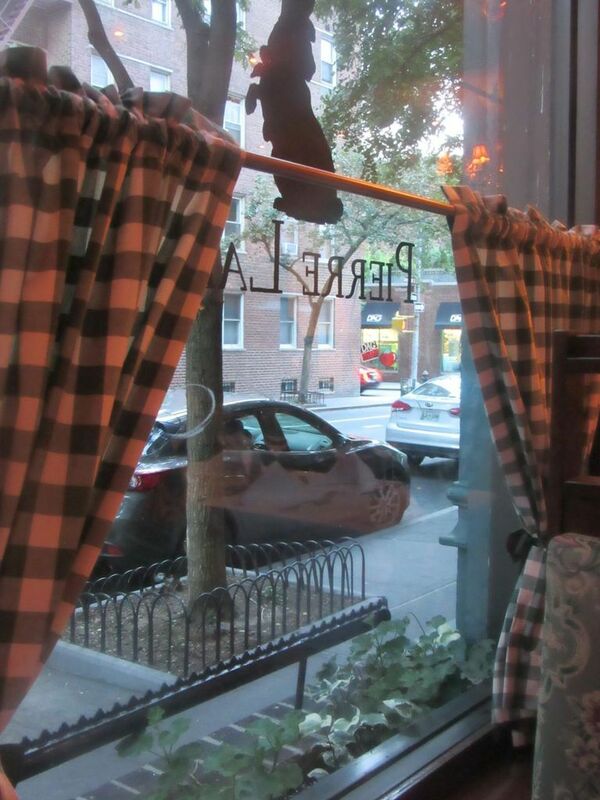 I can watch the sparse traffic going by Pierre Lapin painted on the window from my velvet lined booth. I gasp at the $17 charge on our bill. “Grand Cru Sauternes,” Moore reminds me over the phone the next day. With so many ways to put together dinner here, I can’t predict what your check will be. On our first visit my friend invited her guy to join us. He brought colleague and ordered a $100 Margaux. We each paid $110 each, tax and tip included, Two weeks later, we were three, none of us drinking, at $64.00. The night of two-with- apricots, we left $78.50 each. 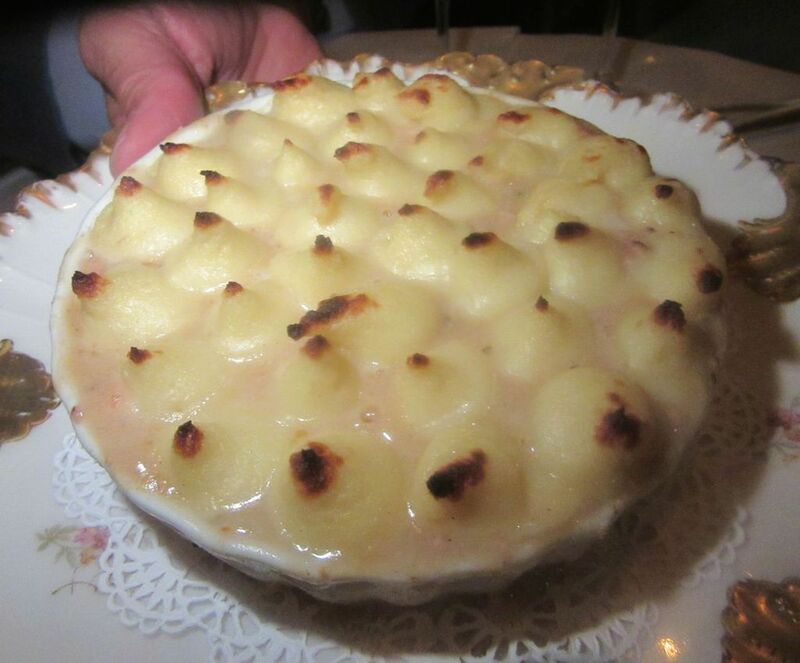 An early menu offered Parmentier Royale, homage to the man who made potatoes popular in France. I’m studying the menu I stole again. 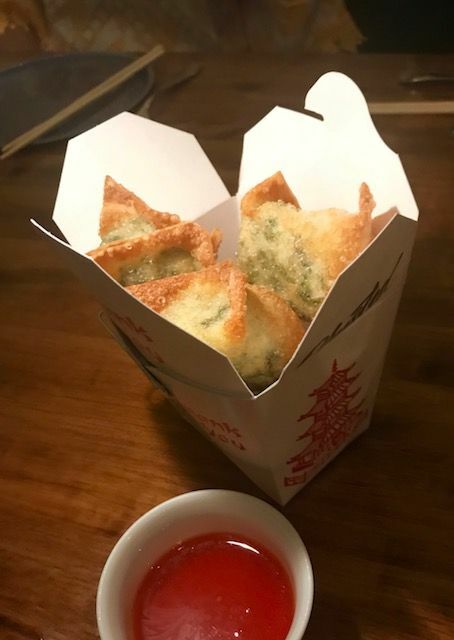 Goat cheese mousse in Parmesan cheese baskets. Courgettes farcis. 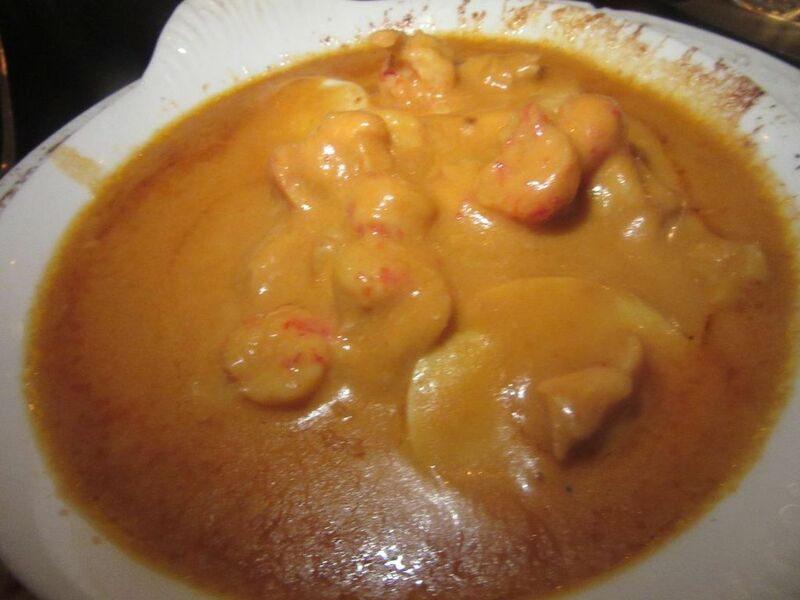 Blanquette de veau. Shoestring potatoes fried in butter. Coeur a la crème. Of course, I'll be back. 99 Bank Street between Bethune and Greenwich. 212 858 6600. Monday through Wednesday 5 to 10 pm. Thursday, Friday and Saturday till 11 pm. Brunch after Labor Day 11 am to 3 pm and Sunday dinner 5 to 9 pm. Breakfast and lunch to be considered.